Cover art of the new edition. 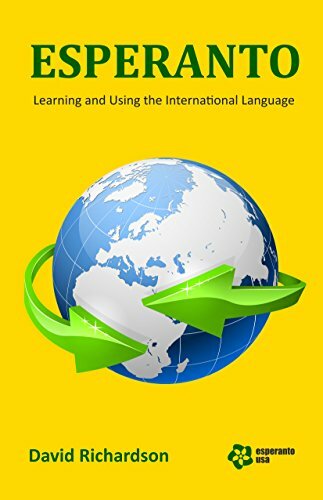 Since its appearance in 1988, Esperanto-USA has published and sold the book Esperanto: Learning and Using the International Language by David Richardson. When it became clear that the existing stock of the book was nearly gone, and there were no plans in place to reprint it, member Lee Miller took the initiative to organize a small group to prepare this valuable resource for a new, 4th edition. The team has revised and edited the introductory material, made changes to the graphics in the Textbook and Annotated Reader sections, and incorporated a new table of contents and detailed index to the grammar. The book will continue to be available as the primary U.S. contribution to the small number of introductory texts available for English speakers. In addition to Lee, the team includes Tim Westover, Ben Speakmon, Murray Merner and Chuck Mays. Tim did the majority of the work preparing the existing PDF document for reprinting. The table of contents and index were originally compiled by Murray and Chuck in Raleigh, North Carolina, and other members of the Raleigh group participated in developing the final form. The new edition is now available at Amazon in both electronic form (Kindle, $2.99) and paper ($9.00).